If you're experiencing shoulder pain without suspecting a broken bone, use this handy self-diagnosis tool from the orthopedic surgery and rehabilitation center the Stone Clinic. Try the following recommended home remedies, and do your best not to strain or put pressure on the shoulder. We're almost certain you'll feel better. But if not, it's time to see a doctor. 1. Stretch arm across the chest. To relieve pain in the right shoulder, hold your right hand out in front of you at waist height. Reach your left hand behind your elbow and gently pull your right arm to the left and across the chest. Hold for 30 to 60 seconds, relax and repeat three to five times. Reverse for pain in the left shoulder. Genesis Orthopedics and Sports Medicine says if you do this and you still feel pain, lower the arm until the pain subsides. The goal is to do this exercise without experiencing pain. 2. Neck release. Sitting upright, slowly lower your chin until you feel tension in the back of the neck. Taking care not to strain, lean your head to one side. You should feel the stretch in the opposite shoulder. Hold for up to one minute. Repeat on the other side. Genesis recommends repeating on both sides three to five times for best results. 3. Chest expansion. For this exercise, you need an exercise band, rope or strap. Hold the band behind your back, grasping it with both hands. Draw your shoulders back and gently lift your chin toward the ceiling. Genesis says to breathe deeply for 10 to 15 seconds and then release before repeating three to five times. 4. 90-90 shoulder stretch. Begin by standing in a doorway. Raise your arms so your elbows form 90-degree angles and your upper arms form 90-degree angles at your shoulders. Place each hand on one of the sides of the door frame. Stand so one foot is forward and the body is upright, neck aligned with the spine. Lean forward, bracing yourself against the door frame. Hold the stretch for 20 to 30 seconds, as instructed by Genesis. 5. Turmeric pain reliever. 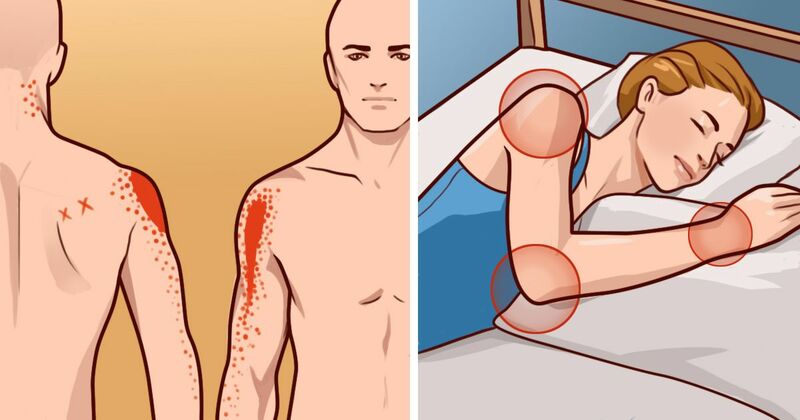 Home Remedy Hacks recommends applying a home remedy of coconut or olive oil mixed with turmeric directly to the shoulder to benefit from the anti-inflammatory properties of turmeric. Avoid lying down with this paste on, as the turmeric will stain. 6. Garlic. Like turmeric, garlic is anti-inflammatory. To relieve pain, massage garlic oil into the strained shoulder, says Home Remedy Hacks. 7. Stand straight. It sounds simple, but Arthritis Research UK explains the importance of good posture in treating shoulder pain and preventing it from getting worse. Check yourself when sitting that you're not slouching and when standing that your head is in line with your shoulders. Always make an effort to keep your shoulder blades up and back. Small adjustments can make a monumental difference. 8. Sleep right. If shoulder pain makes it difficult to sleep, try this supported sleep position, as suggested by Arthritis Research UK. Lay on your good side with a pillow under your neck and a pillow in front of the body so you have a place to prop up your arm. Which of these home remedies worked for you? Tell us when you SHARE this article on social media!